Cars are complex machines. Most of us rely on them daily and we trust that they will work as expected. Faulty cars can be extremely dangerous and can cause injury or even lead to the death of the driver, passengers, occupants of nearby vehicles, and/or other bystanders. While the phrase “defective vehicle” may conjure up images of a low-budget lemon, a recent headline is a reminder that even some of the most expensive vehicles boasting the latest technology can hide a dangerous defect. As a San Francisco product liability lawyer with added experience in automobile accidents, Attorney Brod can help when an automotive defect leads to tragic consequences. As we discussed yesterday, officials have linked a vehicle fire near Seattle to a problem in the battery pack of a Tesla electric car, as discussed in an Associated Press report carried by the San Francisco Chronicle. The incident occurred on Tuesday as the driver of the Model S Tesla was travelling south on State Route 167 through Kent, a suburb of Seattle. The driver told authorities that he thought he had struck some form of metal debris, leading him to exit the highway. He said that the vehicle became disabled and he had begun to smell something burning when the vehicle caught fire. Firefighters arrived on scene only three minutes after the first emergency call and remained there for 2 ½ hours, although it is unclear how long the active firefight lasted. Trooper Chris Webb with the Washington State Patrol indicated that the fire damage was too extensive to allow officials to see whether there had been extensive damage due to the debris the driver had hit before the fire. Tesla officials blame the blaze on the prior collision and spokeswoman Liz Jarvis-Shean reported that the fire, which started in one of the electric vehicle’s battery pack modules, was contained to the front of the vehicle. The Model S, touted by Tesla as the safest car in America, sells for $70,000. It uses a liquid-cooled 85 kilowatt-hour battery, mounted underneath the floor of the passenger compartment, that operates on lithium-ion chemistry akin to the batteries that power laptop computers and mobile phones. 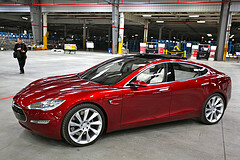 On Wednesday, after videos of the blaze were posted online, shares of Tesla Motors Inc. dropped more than 6%. The market is particularly sensitive to the fire risks of the lithium-ion batteries given three previous battery fires that occurred during crash tests of the Chevrolet’s Volt and the grounding of Boeing’s new fleet of 787s for four months due to batteries overheating or catching fire. While Tesla focused on the collision, an incident report from fire officials noted that the flames reignited after appearing to be under control. Crews switched to a dry chemical extinguisher after finding that water seemed to intensify the flames. In order to fully extinguish the flames, firefighters had to dismantle the vehicle’s front end, puncture holes in the battery pack, use a circular saw to create an access point, and apply water more directly to the battery. In normal circumstances, the NHTSA would send a crew to Washington state to investigate the Tesla fire. However, field investigations have been suspended because of the partial government shutdown. This means it may be some time before it can be determined whether Tesla batteries pose an undue risk. Determining whether a vehicle defect is to blame can often be a difficult issue. It is crucial that those injured as a result of a possible product defect do not sign anything without first consulting a plaintiff-side product injury lawyer. Do not take the other side’s word that blame lies with an intervening cause, such as the road debris that the Tesla’s driver hit before the fire. Remember: A consultation with our San Francisco vehicle defect lawyer is always free and most cases are handled on a contingency fee basis which means there is no charge unless you recover money. Additionally, the NHTSA website provides useful information on searching for recalls and filing reports with the agency. The search function can allow you to see whether there have been other reports with problems akin to those you experienced.